This River is Wild: Gunpowder Day One. After another long week teaching, I spent my Friday night tying flies, drinking beer, and semi-watching A River Runs Through It in the background. I was gearing up for the Gunpowder River in Maryland and was pumped to get on the water for two days. The next morning, I made the hour and a half long trip north of Baltimore to do battle with some of the smallest & smartest trout I have ever fished for. I arrived around 1:30 and the place was quite crowded. 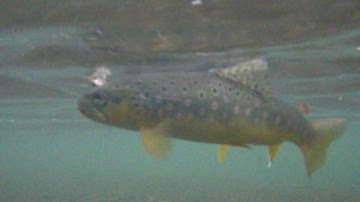 I made my way down to the stream and sight fished to several 7-8 inch browns in the low gin clear water. I was using a size 22 BWO dry fly on 7x that was probably too large to match the bugs on the water. Despite the size, I missed several fish. I was rusty because I didn't fish tiny dries on tiny tippet to trout all summer. Carp will do that to you. After awhile, I finally found a groove and landed some of the beautiful fish. I later transitioned to a butch caddis and a tiny midge dropper and continued to catch fish all along a nice run. I ran into about a dozen fisherman on my way upstream. Surprisingly, no one got mad at one another, which is a very good thing. Beadhead Soft Hackle Pheasant Tail. Thank You Kelly Galloup For Your Butch Caddis. As the sun fell, I caught several more on tiny dries. It was rather hard to make out their subtle takes in the dark conditions. Around 8 o'clock, I realized I was by myself in the middle of the woods and had a long hike out. I attached the headlamp and scrambled my way over boulders & logs before finding the path. I ascended the ravine and made the long hike back to my truck without incident. It was a good time. In The Dark & On The Dry.